Function rooms in Wirral. Hire for parties, weddings and regular events. The village hall is a registered charity and our function rooms are available for regular and one off events. If you are interested in using our facilities please contact Karen Jones on 0151 336 1958. The cafe is open to the public from 10am to 4.00pm, Monday to Friday, serving all day breakfasts, lunches and light snacks, Homemade lunchtime specials on offer every day from 11.30am-2.30pm. 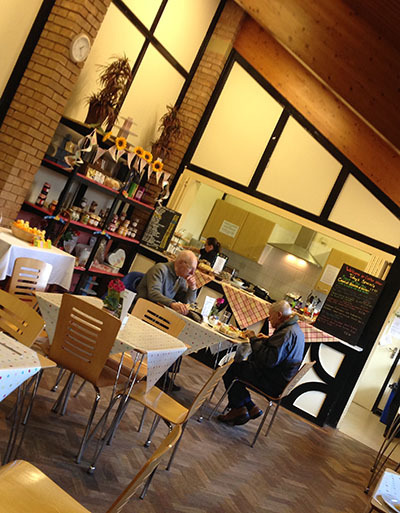 The cafe also stocks a range of local produce, including cakes, jams, chutneys, honey, biscuits, eggs and gifts.Orders can be taken to supply you with fruit and vegetables from our local farm supplier on a week day basis. Bee Keeper meetings-Business Meetings-Craft fairs-Postcard fairs-Summer Fair-Christmas Market. Our Coffee Shop is open for all Fairs. Christenings, Children's parties, Weddings, Wakes. Our inhouse caterers will be happy to chat with you. We are now available to cater for your childs birthday parties if you wish us to, just ask upon booking to see our menus. Check our diary to see what's happening and availability for regular or one off hires.